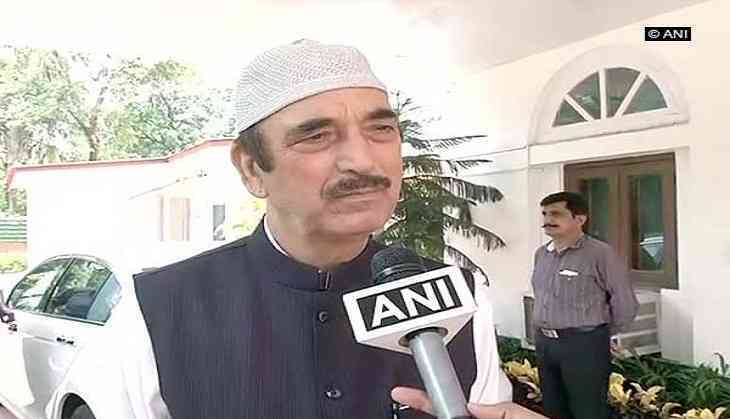 Condemning the brutal lynching of Jammu and Kashmir Police (JKP), Deputy Superintendent of Police (DSP) Mohammed Ayub Pandith by a mob, Congress leader Ghulam Nabi Azad on Friday stated that the brutal act was against both tIslam and humanity. "The way the DSP was lynched to death was so shameful. Killing a person in the holy month of Ramzan is condemnable. If the mob was suspicious about the identity of that person, then they should have informed the police instead of taking law in their hand. Such thing is against both the Islam and the humanity," Azad told ANI. Echoing similar sentiments, Jammu and Kashmir Chief Minister Mehbooba Mufti warned the people of the state to not test the patience of the security forces, who use restrain in dealing with locals. The deceased DSP was aon surveillance and was allegedly clicking pictures of people emerging from the Jamia Masjid mosque, when a mob attacked him. Meanwhile, the Jammu and Kashmir Police said two people have been arrested and a third person has been identified in connection with the lynching of Deputy Superintendent of Police (DSP) Mohammed Ayub Pandith. "Two people have been arrested so far in this incident and third one has been identified. The rest culprits will also have to face the law. According to the reports, when he was coming out of the mosque, people started raising slogans and started hitting him resulting in his death," Jammu and Kashmir Director General of Police S. P. Vaid told media here. He added that the DSP was posted outside the mosque for the security of the people so that they could offer prayers without any hindrance. "A few people who were standing outside the mosque lynched him. This is a very unfortunate act. There seems to be a sheer difference between humanity and cruelty. People need to understand what is wrong. Further investigation is underway," Vaid said.